Los Alamos National Laboratory (or LANL; previously known at various times as Project Y, Los Alamos Laboratory, and Los Alamos Scientific Laboratory) is one of two laboratories in the United States in which classified work towards the design of nuclear weapons has been undertaken (the other being the Lawrence Livermore National Laboratory). LANL is a United States Department of Energy national laboratory, managed and operated by Los Alamos National Security (LANS), located in Los Alamos, New Mexico. The laboratory is one of the largest science and technology institutions in the world. It conducts multidisciplinary research in fields such as national security, space exploration, renewable energy, medicine, nanotechnology, and supercomputing. General Leslie Groves wanted a central laboratory at an isolated location for safety, and to keep the scientists away from the populace. It should be at least 200 miles from international boundaries and west of the Mississippi. Major John Dudley suggested Oak City, Utah or Jemez Springs, New Mexico but both were rejected. Manhattan Project scientific director J. Robert Oppenheimer had spent much time in his youth in the New Mexico area, and suggested the Los Alamos Ranch School on the mesa. Dudley had rejected the school as not meeting Groves’ criteria, but as soon as Groves saw it he said in effect This is the place. Oppenheimer became the laboratory's first director. There is also development for a safer, more comfortable and accurate test for breast cancer by Lab scientists Lianjie Huang and Kenneth M. Hanson and collaborators. The new technique, called ultrasound-computed tomography (ultrasound CT), uses sound waves to accurately detect small tumors that traditional mammography cannot..
Los Alamos Neutron Science Center (LANSCE): The Los Alamos Neutron Science Center is one of the world’s most powerful linear accelerators. LANSCE provides the scientific community with intense sources of neutrons with the capability of performing experiments supporting civilian and national security research. This facility is sponsored by the Department of Energy, the National Nuclear Security Administration, Office of Science and Office of Nuclear Energy, Science and Technology. On June 1, 2006, the University of California ended its sixty years of direct involvement in operating Los Alamos National Laboratory, and management control of the laboratory was taken over by Los Alamos National Security, LLC with effect October 1, 2007. LLAS is a joint venture of the University of California, Bechtel, Babcock & Wilcox, URS and Batelle. Approximately 95% of the former 10,000 plus UC employees at LANL were rehired by LANS to continue working at LANL. Other than UC appointing three members to the eleven member board of directors that oversees LANS, UC now has virtually no responsibility or direct involvement in LANL. UC policies and regulations that apply to UC campuses and its two national laboratories in California (Lawrence Berkeley and Lawrence Livermore) no longer apply to LANL, and the LANL director no longer reports to the UC Regents or UC Office of the President. Also, LANL employees were removed from the UC's 403(b) retirement savings and defined benefits pension program and placed in a LANS run program. While the LANS retirement program provides rehired UC employees with pensions similar to those UC would have given them, LANS no longer guarantees full pensions to newly hired LANL employees. It now provides basic 401(k) retirement saving options. In 2009, 69 computers which did not contain classified information were lost. 2009 also saw a scare in which 2.2 pounds of missing plutonium prompted a Department of Energy investigation into the laboratory. The investigation found that the "missing plutonium" was a result of miscalculation by LANL's statisticians and did not actually exist; but, the investigation did lead to heavy criticism of the laboratory by the DOE for security flaws and weaknesses that the DOE claimed to have found. ↑ "Fact Sheets". Retrieved 26 April 2016. ↑ "The Drive Toward Hydrogen Vehicles Just Got Shorter". Chem.info. 21 March 2011. Retrieved 2012-12-18. ↑ "Los Alamos Scientific Laboratory". National Historic Landmark summary listing. National Park Service. Retrieved 2008-06-28. ↑ Greenwood, Richard (14 January 1974). "National Register of Historic Places Inventory-Nomination Form / Los Alamos Scientific Laboratory" (pdf). National Park Service. Retrieved 2009-06-21. "Accompanying photos" (PDF). National Park Service. Retrieved 2012-12-18. ↑ Korber, Bette (3 March 2010). "HIV Vaccine Strategy Expands Immune Responses". Los Alamos National Laboratory. Archived from the original on October 21, 2011. Retrieved 2012-01-12. ↑ Givan, Alice. Flow Cytometry First Principles. p. 6. ↑ "United States of America vs. Wen Ho Lee transcript of Proceedings". 13 September 2000. Retrieved 2012-12-18. ↑ Epstein, Edward Jay (16 January 2002). "Wen Ho Lee". Wall Street Journal. Retrieved 2012-12-18. 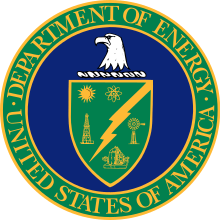 ↑ Energy, Los Alamos National Laboratory, Operated by Los Alamos National Security, LLC, for the U.S. Department of. "Mission". www.lanl.gov. Retrieved 2016-06-30. ↑ "Mission | Department of Energy". www.energy.gov. Retrieved 2016-06-30. ↑ Energy, Los Alamos National Laboratory, Operated by Los Alamos National Security, LLC, for the U.S. Department of. "Capabilities: Science Pillars". www.lanl.gov. Retrieved 2016-06-30. ↑ "Center for Integrated Nanotechnologies (CINT) | U.S. DOE Office of Science (SC)". science.energy.gov. Retrieved 2016-06-30. ↑ Staci Matlock (July 13, 2015). 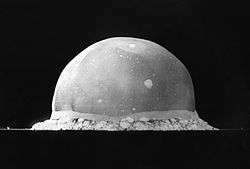 "TRINITY: 70 YEARS LATER 'Los Alamos will never be clean'". The Santa Fe New Mexican. Retrieved 18 July 2015. ↑ Fox, Maggie (9 June 2008). "Energy Dept says new computer world's fastest". Reuters. Retrieved 2016-03-04. ↑ "Los Alamos loses physics archive as preprint pioneer heads east.". 2001-06-05. Retrieved 2016-03-04. ↑ Attkisson, Sharyl (21 March 2005). "Congress Eyes Los Alamos". CBS News. Retrieved 2014-04-14. ↑ noahmax (20 March 2005). "MORE LOS ALAMOS SHENANIGANS". defensetech.org. Retrieved 2014-04-14. ↑ Reichbach, Matthew (12 February 2009). "69 Computers Missing at LANL". The New Mexico Independent. Retrieved 2012-12-18. ↑ Vartabedian, Ralph (26 March 2009). "Los Alamos' Security Flaws Exposed". Los Angeles Times. Retrieved 2012-12-18. ↑ Webb, Greg (27 February 2009). 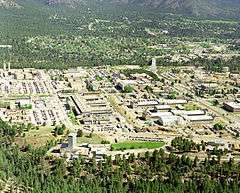 "New Security Lapse at Los Alamos Triggers Angry Response from Energy Department". Global Security Newswire. NTI. Retrieved 2012-12-18. ↑ "Title unknown". Archived from the original on December 12, 2010.